In the summer of 2014 I had the honor of being the Artist-in-Residence at the Masterworks Museum of Bermuda Art. 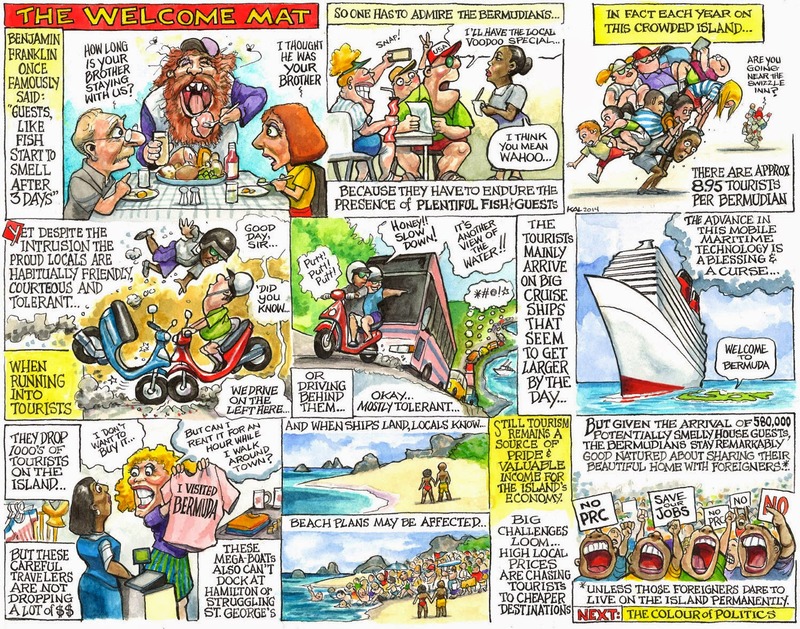 During my 3 month sojourn, I embarked on a quest to capture in satirical style my observations of the island. I have now posted on my website the collection of work I created while on the island. You will find some inside Bermuda jokes, but on the whole, I hope you will appreciate the gist of the narative. A limited edition set of the large cartoons have been produced by the Museum and are available for purchase. Have a read and let me know your thoughts! Kal's New retrospective collection Daggers Drawn is now available to order. Comic strips and consumer culture, 1890-1945, by Ian Gordon, is now online for free. Ian is now a friend of mine, but well before I ever met him, I thought that this book, originally published by the Smithsonian and researched while he worked there, was one of the best books about comic strips that I've ever read. I highly recommend it. You should download it in case he changes his mind; I just did even though I own the paperback. Author and New Yorker cartoonist Roz Chast changed gears for "Around the Clock" [online as Roz Chast talks about her new children's book, 'Around the Clock"
Today's Prickly City is a tribute to 4 of the 5 murdered Charlie Hebdo cartoonists. Mike Lynch has picked up Juana Medina children's book Smick has a promo online. Washington City Paper January 30, 2015, p. 32. Prickly City is on Charlie Hebdo massacre for the 4th day. Here's today's strip. Since Cavna has gone full-time producing Comic Riffs, I won't be linking to all of his stories anymore. Still, here's the rest of today's pieces. 'EXPLODING KITTENS': It's now officially the most-backed Kickstarter campaign ever. Here's how game's co-creator is dealing with that. Prickly City continues its Mohammad cartoon commentary in today's Post. 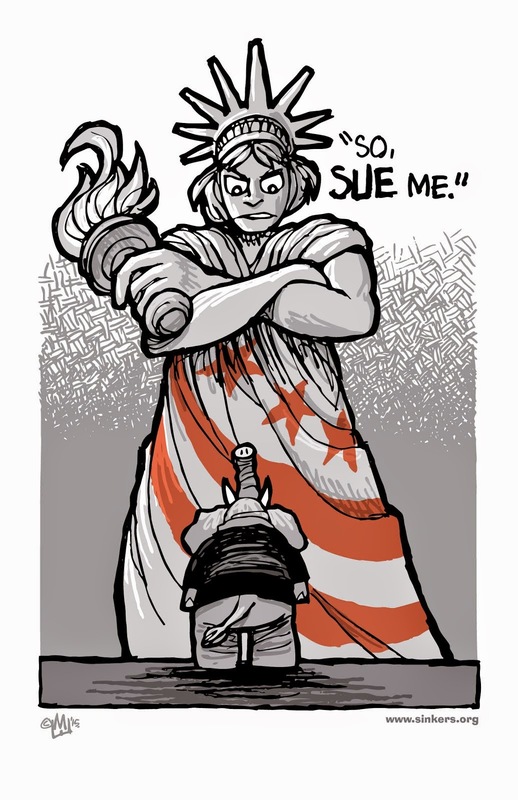 Washington Post cartoonist Eric Shansby has done a painting for Team Cul de Sac's fundraising effort to defeat Parkinson's disease. The painting will be auctioned this spring, but money can be donated at any time. Shansby took over illustrating Gene Weingarten's Below the Beltway column from Richard Thompson, when Thompson moved on to doing Cul de Sac. 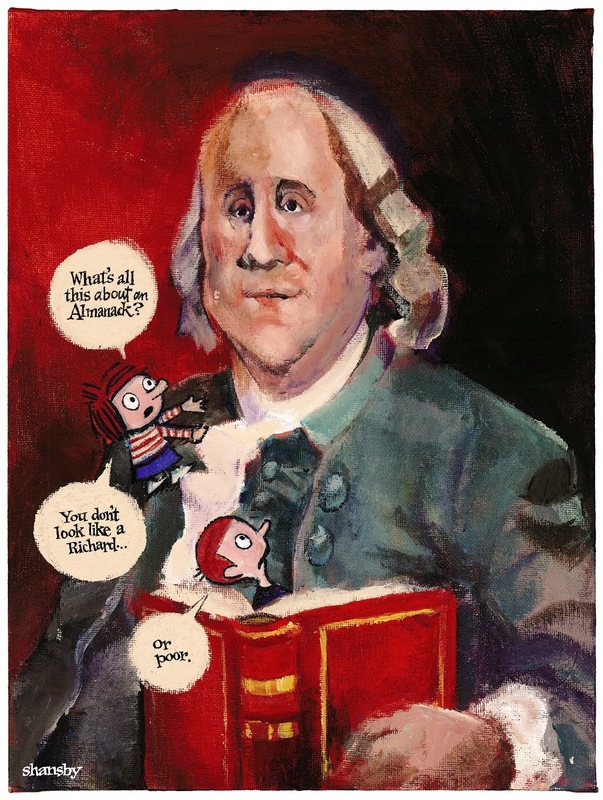 The painting shows Alice and Petey from Cul de Sac, climbing on Ben Franklin, an inspiration for Richard's other Washington Post strip, Richard's Poor Almanac. It is acrylic on canvas board and measures approximately 9"x12". The painting will also be reproduced in the forthcoming fundraising book, Compleating Cul de Sac, which includes interviews, sketches and 100 Washington Post strips left out of the Complete Cul de Sac. Ann Telnaes, Pulitizer prize winning editorial cartoonist; moderating a panel on "Cartooning and Free Speech"
Medina, Telnaes and Galifianakis are local to us. Prickly City continues its Mohammad drawing storyline in today's Post. Bruce Guthrie's pictures of Fantom Comics' March vol. 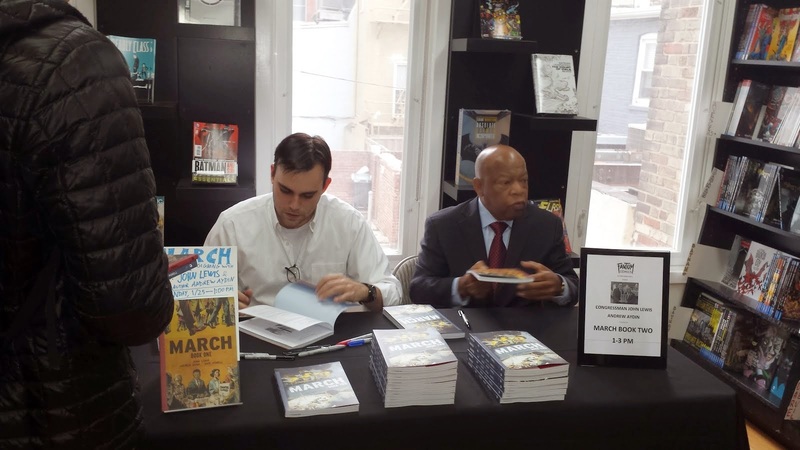 2 signing with Rep. John Lewis and Andrew Aydin are online now. 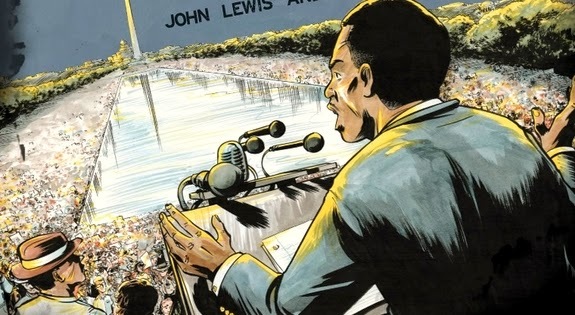 Click to view a video excerpt from his Fantom Comics appearance in which Rep. John Lewis discusses being beaten while standing up for his civil rights. Wow. Click through to see them. As more Americans gain coverage and we near the February 15th HealthCare.gov enrollment deadline, one artist highlights what these diverse Americans have in common in a series of shareable graphics. 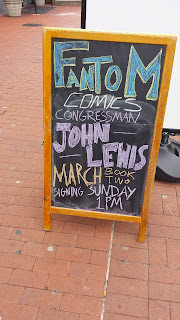 This past Sunday, Fantom Comics on Dupont Circle had Congressman John Lewis and Andrew Aydin's in to sign their book on civil rights, March vol. 2. This recording is of their introductory remarks. I was surprised to see Scott Stantis' strip Prickly City drawing the Prophet in today's Post. You can see it yourself here. A graphic tale of how Allison Hayes, star of the 1950s B-movie "Attack of the 50 Foot Woman," created a legacy with the FDA. Text and graphics by Art Hondros. Washington Post Magazine (January 25 2015). A second look at '60s civil rights. Jared Smith is one of the owning partners of Big Planet Comics, which almost two years ago dipped its toes into publishing by taking on some of the duties of Retrofit Comics. We thought it'd be interesting to check in with Jared on how that partnership with Philadelphia-based comics creator Box Brown is going. Big Planet Comics has been publishing and distributing Retrofit Comics since about mid-2013. How have things been going? Smith: I think really well. 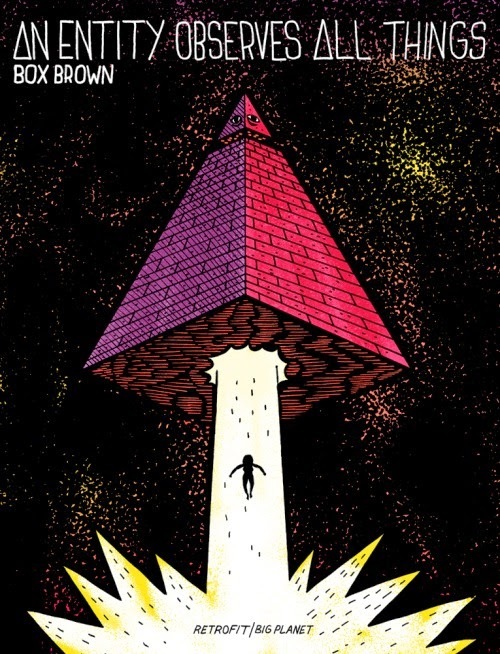 Box Brown, the founder of Retrofit Comics, has a great artistic vision, so working with him as editor and with Big Planet covering the rest of the publishing has been a good team. What has been the biggest challenge so far? How are you tackling that challenge? Smith: Distribution is tricky. It is very depressing to see the same few stores that are interested in carrying small press comic books (I'd say only about 20 in all of the US.) And some areas of the country are well served, like the major cities, but whole other areas have no stores that are interested. We've been reaching out to stores directly and trying to get more reviews and general awareness. 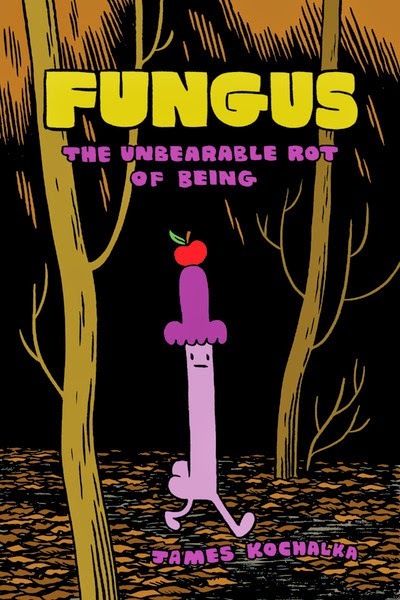 We also distributed our first big graphic novel, FUNGUS: The Unbearable Rot of Being, through Diamond Comic Distributors, which has the best reach into comic stores here and internationally. Big Planet Comics has several shops and locations, each with a different owner, correct? 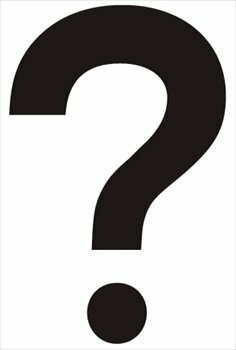 Was everyone initially on board with starting a publishing/distribution venture? Smith: There are four stores, and there are four co-owners. We work together on most things though. Everyone was interested and supportive, but it was my idea and passion so I handle most of it, with help from various members of the Big Planet team like Kelly and Kevin and Peter. How have you been getting the word out about Retrofit Comics? Smith: We send out a lot of copies to reviewers, and of course the internet is huge for letting people know about your work. But we also go to a lot of conventions to reach people directly. It helps we publish such a wide range of artists of different styles and nationalities. I think it makes us a more appealing package, and when fans of one of our artists are directed to us, we have a lot of other things to appeal to them. Several other retail shops around the country have also dipped their toes into publishing — such as Bergen Street Comics with Copra and Desert Island with Smoke Signal — though on a smaller scale. Do you think this is the start of trend? What makes publishing appealing to some retailers? Smith: Yes, there are about 10 retail stores who are publishing as well, such as Floating World, Locust Moon, Kilgore, and Secret Headquarters. I don't know if it's a trend, but it is just relatively easy for retail stores to support some of their favorite artists in a new way, by publishing their work. Most artists who are just starting out do it for the love of creation, and aren't making much money (if any). Plus many prefer to focus on the artistic side, the business side is a distraction from creating more comics! So if we can handle some of that, it works out well for everyone. 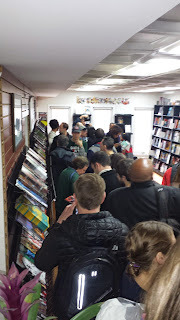 Publishing also distinguishes your store and it helps gets better comics out into the world. "Why can't children's television be more like a good children's library, with lots of diversity," she said in 1983, "and less like the comic-book rack in the local drugstore?" Here's the cover for the D.C. Conspiracy's Magic Bullet No. 10. The free 48-page comics newspaper is scheduled to hit the streets Jan. 30. Cover by yours truly (Matt Dembicki). which I just bought based on this, Dooley recommends Art of RT. How webcomics gave us a fresh take on women and alcohol [Questionable Content; Girls with Slingshots]. Coming in this Sunday's Washington Post Magazine: my illustrated bio on a little-known B-movie actress and DC native who became the 50 Foot Woman. Check it out! Fantom Comics is now honored to host CONGRESSMAN JOHN LEWIS & co-author ANDREW AYDIN for a MARCH Book Two signing and discussion on SUNDAY, 1/25/15, 1-3pm! We cannot believe our good luck in having Representative John Lewis, legendary civil rights leader and inspiring congressman, along with his co-author, Andrew Aydin, here for this amazing event. We'll also be raffling off free, signed copies of MARCH Books One and Two, as well as 2 free tickets to the movie "Selma." We hope to see you all there, and we can't wait for this opportunity to delve deep into the life of one of the original Freedom Riders, Big Six leaders, and Selma March organizers! Let us know you're coming on our Facebook Event page! First 20 In Line Receive a FREE Special Gift! We are stoked to be hosting the creators behind the killer new indie comic series, TOE TAG RIOT, at Third Eye this Saturday! We love this great new horror / comedy hybrid, which pits a bunch of punk rockers turned into zombies against those crazies from the Westboro Church. We'd be totally honored if you guys would pop by and join us for this super fun signing with these great up-and-coming talents, Matt Miner and Sean Von Gorman! Read on below to find out more about TOE TAG RIOT, and make sure you come by & snag a copy and get it signed! When we first saw pages from TOE TAG RIOT, we knew we had to totally get on board with this one! 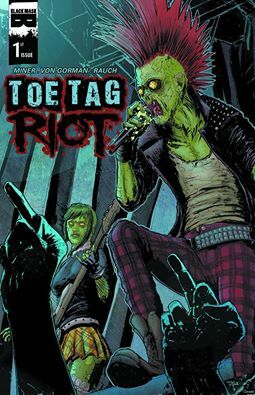 A hilarious and gory tongue-in-cheek story, Toe Tag Riot is about a punk rock band cursed to become zombies whenever they perform. The band goes on a last cross-country tour in search of the cure for their affliction, but being the ethical sometimes-zombie punks that they are, Toe Tag Riot uses their zombie superpowers to rid the world of racists, homophobes, misogynists, and all kinds of other nasty people. 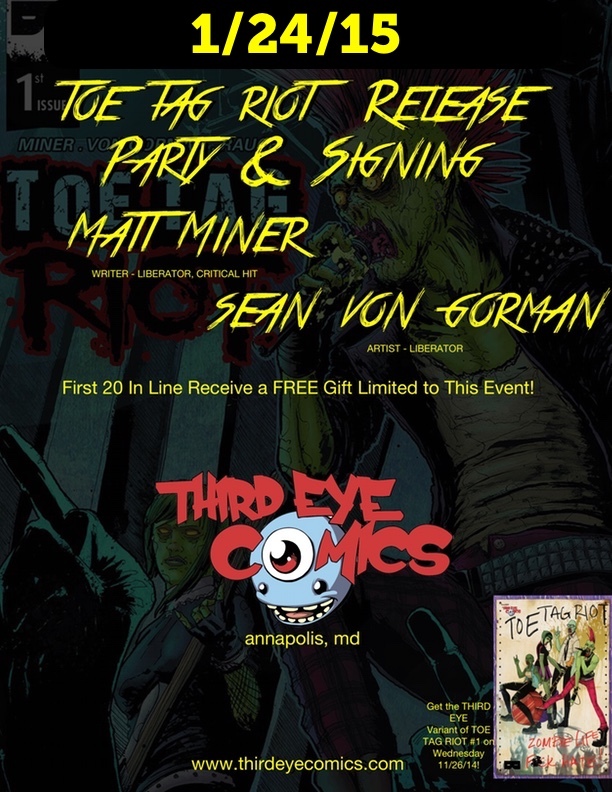 We're so stoked on TOE TAG RIOT that when the opportunity to have creators Matt Miner and Sean Von Gorman to Third Eye to do a big signing for the book came up, we knew we had to jump on it! Be One of the First 20 in Line & Get a RAD Free Gift! You guys know that we love it when you get into the event, and line up to have some fun! And, the creators behind these great books love it just as much! But, what's always really cool for us is seeing the community that you guys build among yourselves when you hang out waiting for the doors to open -- so we like to throw a little something extra cool your way to encourage it! The first 20 folks in line for our signing this Saturday will get hooked up with a very cool free gift! OK, Third Eye Faithful, we look forward to seeing each and every one of you guys this weekend! For those of you who may be wondering if this one will be as crowded as last week's Snyder signing, this one should not be as crazy, so you don't need to worry about the lines going around the block. :) It will be a blast though, so make sure you show up and have fun with us! Late in this interview, RW Alley notes that he's done two comic book style books with his wife Zoe Alley. I just ordered them for my DC-area cartoonists collection. Rep. John Lewis and Andrew Aydin, co-authors of the March graphic novel series based on Lewis' experiences as a leader in the early days of the civil rights movement, will be signing the just-released second volume of the book at Fantom Comics (Dupont Circle) Jan. 25 from 1-3 p.m. Visit the Facebook event page for more info. Newsarama did a Q&A with Lewis earlier this week. An animation studio moving from Los Angeles to the District is in negotiations to lease space at the Boilermaker building in Capitol Riverfront for its new headquarters, according to Elevation DC. Make sure to get yours before we sell out. No Door Sales. Tom Toles is the Pulitzer prizewinning Editorial Cartoonist for the Washington Post and is widely syndicated nationally. He has covered government, politics and society in six cartoons per week for the Post since 2002. Previously he has been Editorial Cartoonist for US News and World Report, The New Republic, The New York Daily News, The Buffalo News and the Buffalo Courier-Express. 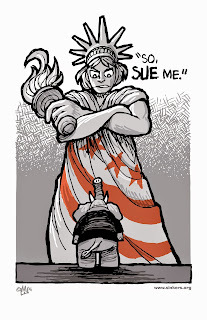 Flugennock's Latest'n'Greatest: "So Sue Me"
Long story short: DC Mayor Bowser and the City Council plan to defy Congress and honor the will of the voters and implement Initiative 71. A gaggle of GOP clowns in the House are threatening litigation to prevent it. The response of Mayor Bowser and the Council is, in so many words, "so, sue me." 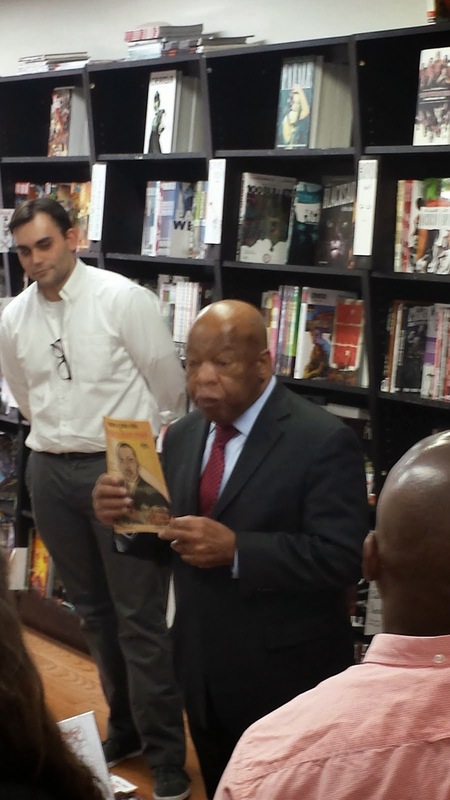 Q/A with Congressperson John Lewis at our DC show in April of 2014! Who knew this was online until Cavna linked to it earlier this week? Not us. "The Art of Richard Thompson"
#Nous vomir dans votre direction générale!